“Jeremy is the epitome of a well-rounded athlete. 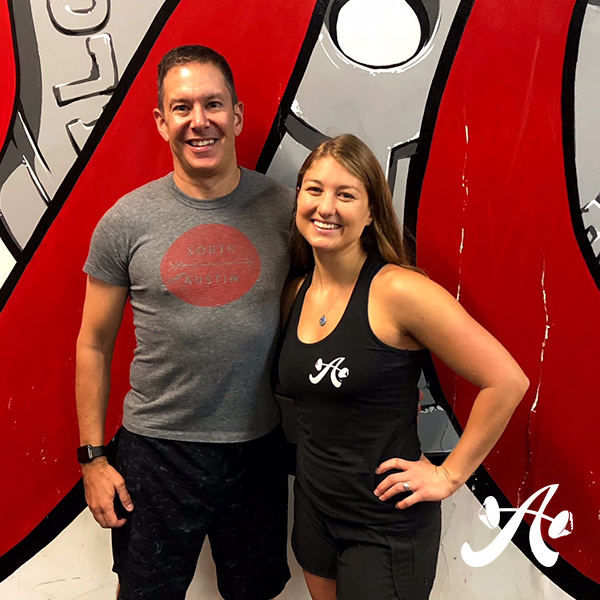 He started at ASF in October of 2015 with the goals of getting stronger, changing his body composition, and improving his shoulder and upper back strength and mobility. Over the years, we have steadily addressed structural issues while building Jeremy’s overall strength and mass. Jeremy consistently sets definitive, attainable strength and mobility goals and meets every one of them. We joke that as soon as we fix one broken part we find a new one, but the truth is the parts we fix stay fixed, due to Jeremy’s understanding of his own body and targeted mobility work. Jeremy also lives a great example of a super-fit but realistic lifestyle. Even while paying close attention to his nutrition to get his body fat down, he knows when to relax and let himself have fun with family and friends. He makes his three sessions a week at ASF and his running a priority, and it shows – he has consistently lost body fat while gaining muscle, beaten his goal of benching his body weight, and mastered pull-ups (without pain!). I direct battery research for a nanomaterials company here in Austin. I started working out at ASF in October 2015. I had never done much in the way of weight training, and my usual exercise routine of running on the Town Lake Trail was yielding diminishing returns. In the past, I’d been intimidated by going into the gym and not really knowing how to set up a workout or improve form or technique, so it was important for me to find someone who could coach me. Getting stronger, changing my body composition. Every time I’ve had my body composition measured since I started at ASF nearly 3 years ago, I’ve steadily gained lean mass and decreased fat mass. I’m close to the composition I’d like to have. Starting to think about strength and flexibility as something I aspire to and not just a means to an end. Overcoming years of bad posture, some injuries, and some very weak shoulders! Learning that I had to learn how to get some muscles to fire at all, or to get some overactive muscles to relax and not try to do the work in an exercise. I thought that I knew how my body worked after living in it for more than 40 years, but I actually had to learn how to engage certain muscle groups that were chronically underutilized. Why do you like working out with Beckie? Beckie is friendly and supportive, but always challenges me to keep making progress. I liked the workouts so much that my wife Alex started training with her, too. What is it about Beckie/ASF that keeps you coming back? We continue to make progress, and we work together to find new interim goals. That makes it interesting. Finally hitting my target body composition and then moving on to some lifting competitions. I think that the most important thing is to make your training part of a routine. Make the time on your schedule and commit to it. The sessions are just 30 minutes long, so you can fit that in to your schedule, but you will get a good workout, and you will start to see results fairly quickly. Once you start seeing results, you’ll be inspired to do more. Anything else you’d like to add about your experience at ASF or with Beckie? I’ve seen steady improvement, year in and year out. Beckie is a great trainer and a great friend, too.